A man in Scotland faces four years in prison for carrying a… potato peeler “without reasonable excuse” (http://www.breitbart.com/london/2018/05/03/scottish-man-custody-carrying-potato-peeler-public-place/). The suspect, who is said to have “mental health issues,” was stopped by police for some other reason, which led to them finding the potato peeler in his possession. Meanwhile, the gun-free zone of London already has 62 murders this year, surpassing New York City’s total. Some of those murders have been committed with guns that the perps weren’t supposed to have, the rest with knives, machetes, or acid. But none with potato peelers. 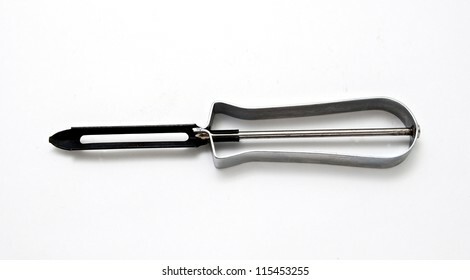 Worldwide, how many murders have been committed with potato peelers? I suppose it might be possible, if you really put your mind to it. But then it’s also possible to murder someone by clobbering him over the head with a toaster-oven or forcing a toy dinosaur down his throat. You might even be able to kill someone with a hairbrush, if you were creative enough. Do our glorious leaders want to “control” everything? Yeah, probably. That’s what makes them tick. It’s all part of a weird ideology that claims that all crime, all disease, all injustice, all inequality, all unfairness, all whatever can be eradicated from our world if only the right philosopher-kings are given absolute power over us. I don’t think the people who believe that are quite all there. But that’s their substitute for Christianity: sinners playing God. This entry was posted on Thursday, May 10th, 2018 at 1:48 pm	and tagged with government control of everything, insane public policy, London murders 2018, man arrested for carrying potato peeler, murder weapons, sinners playing God and posted in news, religion. You can follow any responses to this entry through the RSS 2.0 feed. They’ll want to confiscate envelopes, too. I’ve had many a nasty paper cut from envelope flaps. Unless there’s some significant part of this story missing, those deputies should be made to surrender their badges and find work that fits the limited level of judgment they possess. I suggest potato peeling. OMG!!!!!!!!! The nerve of those guys. They need to be arrested by cops that don’t carry evil, pointy, sharp badges. Hmmmmm? I think I just described mob rule, which is frighteningly close to what is happening all around us. Once our masters control everything, all our problems will disappear. At my sword school they offered a course in pencil-throwing. Honest. Which reminds me that they ought to ban rubber bands, since I recall using them to make slingshots when I was a child — to shoot paper clips, come to think of it, so those ought to be banned as well. I didn’t get where I am today without carrying a potato peeler in my purse. that should be banned. You could strangle someone with one of those. Knife control is underway in the UK. There is a knife amnesty where people are turning in their knives–wonder if that applies to surgeon’s scalpels and butter knives. I guess fencing is verbotten now. Over 800 knives have been turned in in Lancashire county. I’ve read of this myself. Apparently society has fallen so far that they no longer consider themselves capable of being trusted with a paring knife. A pocketknife is an all-purpose tool with dozens of everyday uses. I carry two of them. I guess in the UK they’d have to arrest me twice. I tell you, something is very wrong in our civilization. Considering anything can be made into a shank, they are fighting a losing battle. All kidding aside, you are 100% right. There is something deeply wrong with all of this rhetoric. It’s gone beyond political opinion; it’s something deeper, more frightening. You should see what I can make by folding a cardboard cookie box. It turns into a weapon. Rather nasty.